Zac has spent his whole life on and around boats. His father was always fixing up boats and using them for family cruises before selling them. A sailboat was literally Zac's first home, and a three-year family cruise was a formative experience during Zac's preteen years. An experienced young sailor who had already logged over 15,000 sea hours, Zac spent all of his savings to buy a 36-foot sailboat named "Intrepid" for the circumnavigation trip. His father, a shipwright who also runs a yacht management company, retrofitted the ship with sophisticated communications, safety equipment, a water maker, and many other custom upgrades. Zac is the youngest American sailor since 1965 to attempt a solo global circumnavigation. That was the year 16-year-old Robin Lee Graham departed Los Angeles, but Graham did not finish his voyage until the age of 21. Graham's book, Dove, was one of Zac's inspirations. Zac will sail west from Los Angeles on approximately the same course as Graham, but plans to complete his voyage while still 17 years old. The record for the youngest solo circumnavigation since Robin Lee Graham has been held by an Australian, David Dicks, who was age 18 years and 41 days when he completed his voyage in 1996. 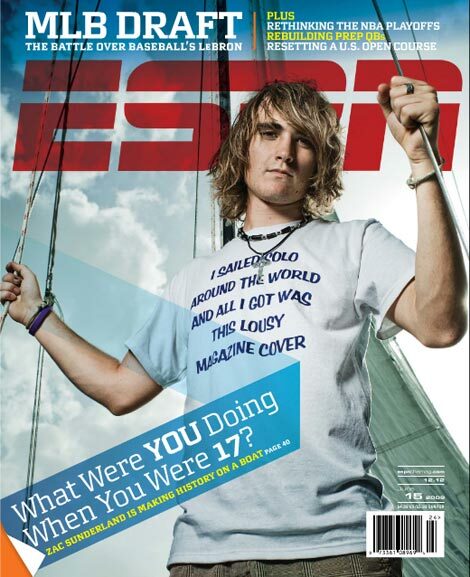 Zac Sunderland won't turn 18 until November 29, so he should easily beat that record. Zac is also following in the footsteps of another hero and friend, Jesse Martin, who completed his own solo, nonstop, and unassisted circumnavigation at age 18. The eldest of seven children, Zac is a homeschooled straight-A student. He brought books along to study on board so that he could finish his high school education during the 40,000-mile journey. "I have all my books with me. I have one more year to finish at high school and I have to send back my tests (via e-mail) to my mum. She's going to grade them and make sure I am doing well." Zac will have plenty of projects to keep him busy when he returns. He would like to write a book and he also plans to put together a documentary using footage from the eight video cameras aboard his boat. Included in the footage is a pirate ship circling his sailboat between Indonesia and Australia. Locking himself behind the bullet-proof glass of his cabin, he made a call on his satellite phone to notify authorities, who sent a plane that presumably scared off the pirates. Zac has stated, "My dad says cruising is 80 percent hassle and 20 percent fun, but somehow that 20 percent outweighs the 80 percent. When you're in port and it's like a beautiful day and you've worked so hard to get somewhere, it makes it all worthwhile." The Sunderlands estimate that Zac's entire trip will cost $150,000. While Zac used his own money to buy the boat and was able to sign up some sponsors, he's borrowing the rest from his parents. Unfortunately, his dad's business has suffered because of the recession, and the family has been sinking further into debt as a result of all the extra expenditures. Coincidentally, another contender this year for the record of youngest solo circumnavigator is 17-year-old British sailor Mike Perham. At one point on their respective journeys, the two adventurers happened to have a chance meeting with each other in Cape Town, South Africa. Mike left on November 15, 2008, aboard a sleek, fully provisioned 50-foot racing yacht named after a sponsor, "TotallyMoney.com." He had planned on sailing nonstop and completing his journey in only four months. But he was plagued with breakdowns and his plans to sail nonstop came to an end when he was sidelined for more than a week due to problems with his autopilot. This unanticipated complication also coincided with a rather nasty tropical depression that would later be upgraded to a Category One Hurricane. Both of these developments had Zac heading for a safe harbor. Zac’s father and grandmother flew down to be with him at the Paradise Village Marina in Nueva Vallarta. The repairs were completed in just five days and the weather abated. As of June 27, the conditions were right for Zac to continue his journey toward home.